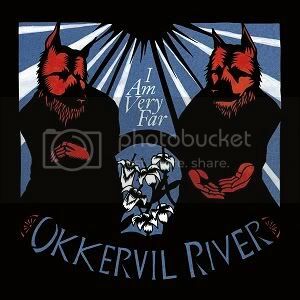 My relationship with Okkervil River could be described thusly: they're a reliable friend that I don't see often. Then one boring night, I'll go on Facebook and post "Anyone up for hanging out?" Next thing I know, Okkervil River calls me up and says "Hey man, let's get that beer!" So I'll run out and meet them, and have a genuinely great time, and on the drive home I'll think, "You know I should really hang out with Okkervil River more often." But I get busy, and maybe a little lazy--not to mention they have plenty of folks who call them more often than I, so it's not like they're waiting for the phone to ring. So we fall out of touch for a few months, maybe even a year. But we'll never hesitate to get back up when we can, and it's always a pleasure. Consider that a long way of saying they aren't one of my favorite bands, but I appreciate having them around. Such was what warranted their inclusion in IMM2.0. I Am Very Far was announced back in January, not long after I revisited the terrific Stage Names. I still maintain "A Girl in Port" is one of the best songs written in the aughts--certainly one of the top ballads. Their first new LP proper since (2008's The Stand Ins was borne out of the Stage Names sessions), can I Am Very Far continue their knack for sprawling chamber pop melodrama? Sort of. The problem with the album is that it struggles early. Opening track "The Valley" will get your head bobbing, but it's a curious choice as opener. It isn't very dynamic, nor tone-setting, and there's something vaguely hokey about the line "He has fallen in the valley of the rock and roll dead." The next three tracks fail to inspire--second track "Piratess" lolls along drably, doing its best to taper off any momentum its predecessor stirred up. If only they'd read our feature on second songs! "Rider" and "Lay of the Last Survivor" aren't offensive, but they come off as "Okkervil River by Numbers." When the latter concludes, you wonder if I Am Very Far will, in fact, go any farther. Thankfully, things pick with "White Shadow Waltz", which really should have been the opening track. It's bubbling with energy, it's exciting, and it revives the album. From then on, the band is on point. "Hanging From a Hit", the album's strongest track, begins as a delicate waltz with Sheff's vocals dialed back--this allows the band's harmonies are to bloom a bit, which proves to be a strength. It's a tactic I wish they'd embrace more often. "Show Yourself" begins with brooding Elliott Smith repetition, but eventually picks up into a chilly gallop. It's arranged with an effective sparsity that might owe something to Radiohead's In Rainbows. If there's one inevitable live staple on this album, it's "Your Past Life as a Blast", due in large part to the repeated line, "No one, no one, is gonna stop me from lovin' my brother." Fitting for a song with the feel of a seventies groove anthem (think "Good Morning Starshine"). "Wake and Be Fine" is a fractured waltz, and one of the album's best moments. Uniquely arranged, Sheff spits his lyrics over and around the jerky drum beat, as the band stitches piano plinks and string swells around the song's edges. The song fades into "The Rise", the cathartic closing track with an overlapping call-and-response lyrical structure that begs to be bellowed from a Broadway stage. It's a truly stunning closer, the largely instrumental outro sways along as electric guitar textures, crashes and piano rolls fire off like dying strains--it's exit music, pure and simple. I don't know if I've ever heard an album with such a stark jump in quality. I'm not sure if I should celebrate the strong mid-to-latter portion, or lament the fact that the album as a whole is sullied by the slow start. Either way, if the early portion was up to the standard of the rest, I Am Very Far would be right up there with the best albums we've seen this year. As it stands, it might have been better off trimmed down to an EP. Pros: A nearly impenetrable stretch from "White Shadow Waltz" to immaculate closer "The Rise". Cons: The album takes about twenty minutes to get its wings.